Road Trip - Cabin Fever and more. New water surface at Accokeek Creek. The water fall over the spillway needs to be added next. I reworked the water in Accokeek Creek this weekend. For the front part of the creek, I wiped away the resin while it was still wet. After a few days I scraped away the old banks and built new banks with water putty. I did not like the way the old bank widened by the fascia. I also made the banks deeper. The terrain slopes here and the Magic Water would run to the front edge if I did not make the channel deeper at the fascia and less steep overall. It still has a slight pitch down toward the fascia. I did not worry too much about the ground cover, as I will add that when the resin cures. The resin will seep via capillary action up any ground scatter that is along the bank. So it is best to scenic the waters edge after the resin cures. I used my photoflood to warm the resin as it cured. With the light shining it cured in about 2 hours to the point where I could add some ripples in the resin. I poked the resin with a wooden coffee stirrer to make the ripples. For the back part of the creek, I repainted the banks and much of the existing resin surface to disguise the rusty red color. Then I poured a fresh layer of Magic Water with some brown and green drops of Testors enamel. In a few days I will add some fresh texture to the banks with lots of tall weeds and grass. I also added a thin layer of clear resin to the surface of Potomac Creek. This helps enhance the illusion of water depth. Still not sure what to do about ripples here. Overall, I am very pleased with the Magic Water. I am now convinced that I will use this for the main water surfaces at Aquia Landing. I added another layer of Magic Water to Potomac Creek. Before pouring the water I mixed in a few drops of Testors Enamel Dark Brown and Olive Drab Green. The effect of the muddy layer on top of the existing layer of water and dark creek bed is quite convincing. This matches the colors I see when looking at satellite images of Potomac Creek. I still have not decided what to do about the rusty water in Accokeek Creek. I suspect I will paint over it and start again with a treatment like Potomac Creek. I have been researching and testing some new equipment to improve my video recordings. To date I have been using my iPhone video capability. I tried using the Filmic Pro ap for the iPhone. It allows manual control of the iPhone video camera. While that is very cool, there were still a lot of video functions I could not do. Most notable was the inability to zoom optically. I used a slider to get some cool cinematic effects, but the lack of zoom was a problem. Recently I purchased a Canon 70D DSLR that has advanced HD video capability and improved auto focus, especially on moving objects. I went with Canon as I already have a Canon 5D DSLR and I am familiar with their operation. The 5D is a full-frame 12.8megapixel sensor, still image camera. In contrast, the 70D is a cropped-frame 22.2 megapixel sensor camera for stills or video. In video mode it shoots using only a small portionof the sensor. Because of the cropped-frame sensor it has a 1.6x telephoto effect. (One multiplies the cropped sensor focal length by this factor to get the equivalent focal length on a full-frame sensor.) 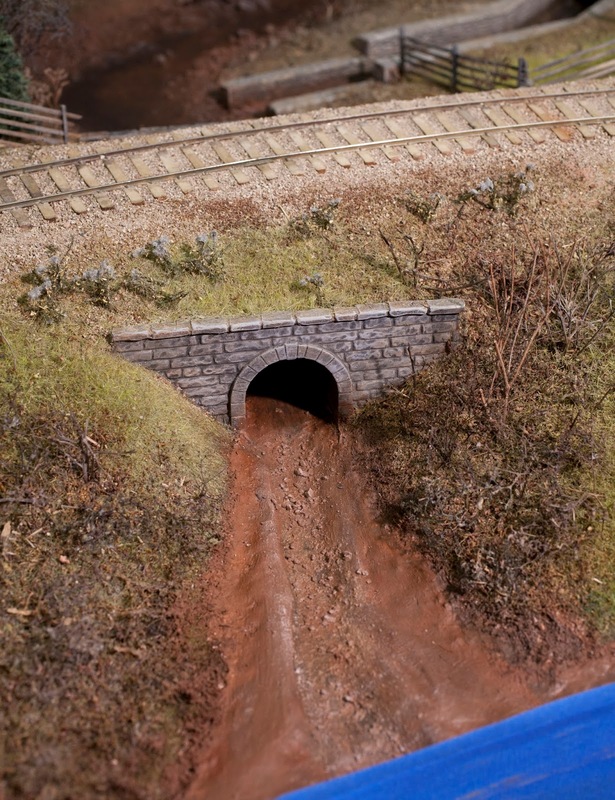 That is troubling for model railroad photography where we usually want wide angles and not telephotos. However, for other photography the increased telephoto might be useful. The 70D is available with a 18mm-135mm zoom. At 18mm the lens is equivalent to a 29mm lens for a full frame 35mm sensor. That is sufficient for model railroad shots. I am not sure how the cropped sensor compares to standard video camera optics. In addition, the cropped-sensor grants increased depth of field due to the effective smaller apertures at any given f stop compared to full-frame sensors. For most videographers this is a drawback as they like shallow depth of field to achieve the so-called bokeh. But in model railroad photography we usually want increased depth of field to simulate the hyper focal range of prototype rail photography where everything is in focus. My initial tests with the 70D are promising. See the video here. I used the 70D mounted on a Kamerar 23 inch slider, Manfroto Ball Head and a heavy duty Manfroto tripod. I do not own a fluid damped video head. In addition to the layout lights, I used a 700W 3200K tungsten bulb for extra illumination. Most of the shots were at about f7 and ISO1200. You need a lot of light to shoot at these small f stops with video as your shutter speed should be less than the 1/(2x frame rate). I used iMovie to make the video. It allows for some limited color and exposure correction. I have a copy of Adobe Premiere Elements, but I have not tried it yet. The current iMovie version is fairly easy to use. There is still a lot to learn, but it will be fun doing so. If you are a still photographer, like I was, and are getting into video, you may find this book by Richard Harrington very helpful. He takes you through the whole process from equipment selction to editing software. Very much recommended. I am just about done with the Accokeek Creek area. To finish off the scene I built 4 wire trees and several smaller bushes from Supertrees and Sedum flower heads. I installed them on the slope above the creek in front of the simpler weed based trees.The wire trees and underbrush provide enough of a view block to help disguise the simpler trees behind. Together with the trees painted on the backdrop, the overall scene seems to work well. Stucco Gesso to add bark texture to the trees. The next step was to add water to Accokeek Creek. I added a layer of Magic Water to the Creek bed. For various reasons that seemed good at the time, I decided to tint the water with some brown laquer based paint. I ended up adding too much paint and the water came out too dark. I also had some resin leaking at the dam on the front edge where I used masking tape to seal the gap. I caught it before it made a big mess. I am not worried about the color as once the water is cured, I can fix it probably by painting it and adding a new layer of water. While I had the Magic Water out, I poured the water in Potomac Creek too. That tape dam did not leak. I did not tint this water. Once the resin is cured on both streams, I will evaluate what else needs to be done. The cows are trying out some of the static grass. While the resin was curing, I started building a storage shed at Brooke. This structure is 17 inches long and 6 inches deep. The slope of the hill prevented me from making it deeper. Magic Water in Potomac Creek. I used my DSLR for the three shots of finished Accokeek Creek. The others are handheld iPhone shots. With my DSLR I used RAW and custom white balance settings. This results in photos with accurate color rendition on my monitor. In looking at static grass photos around the web, I have noticed that static grass is hard to photograph as its glossy texture tends to over saturate colors with most digital camera. It takes retouching with destaurate tools and levels/curves to make the static grass look correct. 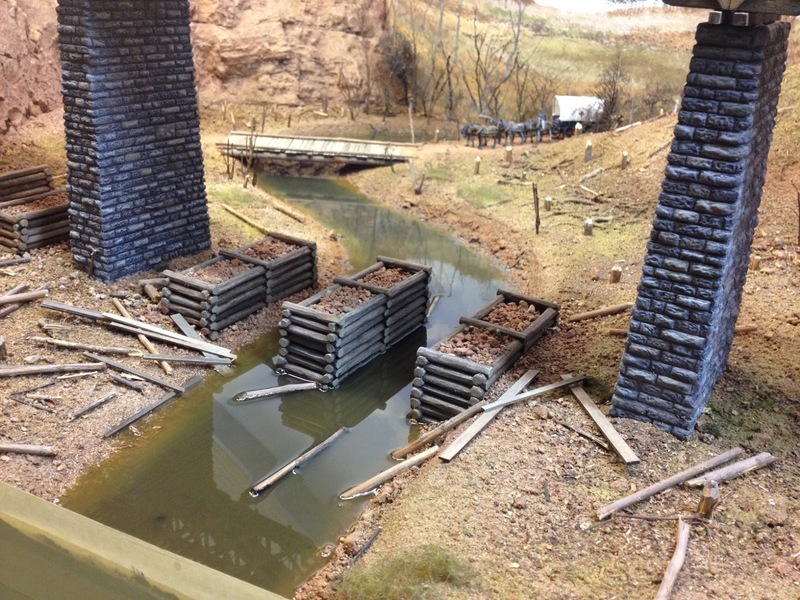 Scenery work on Accokeek continues. I filled in the woods behind the pines and extend the fence. I also muted the contrast of the pine needles under pine trees and the grass. areas with more bare trees. I've been plugging away at the scenery at Accokeek Creek for the past few nights. The static GrassTechII is getting a work out. I am fairly pleased with it as it works great, when you remember to turn it on. In a few nights this area should be done. Here are some work in progress shots with wet scenery. It is hard to capture the correct color with my iPhone. The grass is not quite as green as the images show. View toward Accokeek creek and the south end of Brooke siding. This weekend I did a road trip to Pennsylvania and New Jersey. The main purpose of the trip was to attend a family event in New Jersey on Saturday, but the trip diversions are probably of more interest to the blog readers. On Friday I visited Gettysburg, PA on the way to my mom's house in Lebanon, PA. It was raining steadily when I got to Gettysburg. So I just made a quick stop at the Toy Soldier Shop to pick up some miniatures for the layout. I stocked up on Perry American Civil War Cavalry and another set of Zouaves to join the set I already have. These Perry figures are injection molded plastic and are very nicely done. The cavalry are molded in several pieces. The horses are two pieces, while the men have various options for arms, hats, and weapons. Being plastic they are easy to modify. site based around a 18th century iron works. It is part of a National Historic Landmark District, and America's most complete remaining charcoal fueled ironmaking complex. The museum was not open when I was there, but I got a few shots of the furnace. It operated until about 1880 and provided ordnance to Union civil war armies. It is definitely worth a visit while it is open. Later in the afternoon, I went to the Cabin Fever Expo 2014, the largest model engineering meet in North America. This was the first time I attended this event. I caught the end of the show and some of the displays were being removed. Nonetheless, I saw some very interesting models and tools. The event includes live steam trains in all scales. The largest one I saw was a Union Pacific Big Boy that weighed over 3,000 pounds including the tender. Several of the Accucraft Gauge 1 live steam models were on display and for sale. The fellow at the left was kind enough to pose behind his Pennsy T-1 to demonstrate the size of the model. The Sandy River and Rangely Lakes engine was impressive in large scale too. This LST model caught my eye. It is a 1/96th scale model with HO vehicles on board. This model could be used to depict the LST railroad ferries used in the D-Day campaign. For more information you might want to check out my book when it comes out. I have a chapter on the D-Day operation. There are several 1/96th scale LST kits available for sale, but this would not be that hard of a ship to scratch build in HO, 1/87th scale. The business end of the LST. For a model railroad, this end of the ship would have the doors open and railroad tracks laid to the deck. For those of you interested in O scale, the Scale Shipyard is producing a kit for a 1/48th scale LST. Now that would be a cool model and layout! There was a large temporary pond for radio controlled ships, as well as this dirt pile for construction equipment. There were also live steam tracks, a paved circuit for R/C cars and trucks, and a enclosed net for R/C aircraft.. The video below shows some of the models and tools I found interesting. My Heki Flockstar Grasshopper static grass machine stopped working a while ago. It was disappointing as I did not use it very much. Recently I ordered a GrassTech II machine from GrassTechUSA. It arrived today, so I tried it out. Accokeek Creek getting some scenery work. Note the new embankment for the creek. It definitely works. I was able to apply tall grass fibers very easily using the plug-in cord. I did not try the 9V battery option. 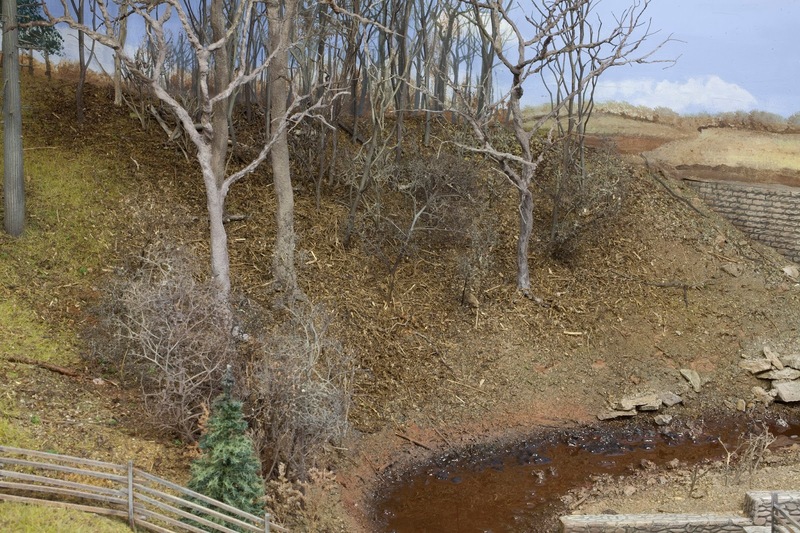 I am adding a bit more green to the layout as the grass and trees start greening up in Virginia in early April, about when I am modeling. I haven't picked an exact date yet. While I was at it I reworked the creek bed for Accokeek Creek building up an small embankment with mud (dirt and dilute white glue). Once this dries I'll go back to clean up the loose fibers, and add some individual shrubs and plants. The convention looked like a very successful meet. There were about 160 folks present. Many were involved in hands-on clinics including track laying using Fastrax jigs, home made static grass machines, weathering, and many others. I saw a lot of kids working on the hands-on clinics- very encouraging. The Western Maryland Historical Society's Modular Group had a layout set up. There were some neat trains running on it including Mike Kieser's cold war era military trains. He told me he built it to showcase the types of tanks his father operated in the Korean War. Two fellows brought interesting pieces of rolling stock for show and tell. The first (I didn't record his name, so please let me know who you were) had a Camden and Amboy 1870s era box car that he scratch built from plans in John White's book He said the car was an ex-USMRR car featured in one of John White's book, but I could not find it. It was nicely done with arch bar trucks and knuckle couplers. Steve Groft show a work-in-progress scratch built HO scale 4-4-0. He made nearly all the parts by hand with files and Dremel Motor tool. That was a nice piece of work. I am looking forward to seeing it finished. Steve Sherril was there with a neat On30 modular set-up he built to showcase the "Dead Rail Society." He was running some of his tiny engines on battery power. He was even showing how he plans to use solar collectors to power his locos. It was very cool. His layout consisted on small sections about a foot deep and 4 feet long. He uses no backdrop and no legs. He sets up on convention tables. It's all very compact and portable. Perhaps this is the paradigm for my next portable layout. My talk went very well. I was in uniform for the talk and it was a good thing I brought it, as it was still very cold up in the mountains. But no snow fortunately. Several of the guys in attendance were Gettysburg Battlefield Tour Guides. It was fun to meet them. I also showed a 5 minute video afterwards with scenes from my railroad. On the way home, I had a slight problem with one of my tires. OK, a big problem. Luckily I was able to pull over, then get the car towed to a safer location and then change the tire. Everyone is home safe and sound (except for that tire). I recently did a quick look article for MRH on the Stanton Battery system. The article was essentially a compilation of various of my notes from this blog. Long time readers of the blog will have seen most of it already. In this post I thought it would be useful to address some points not in the article, and answer several questions I got from people via email and forum posts. I realize that DCC is like a religion. These are my observations and I am not trying to convert you. I did not spend much time in the article spelling out some of the advantages of battery power. In case you are not aware, here are some things I find very handy. 1. 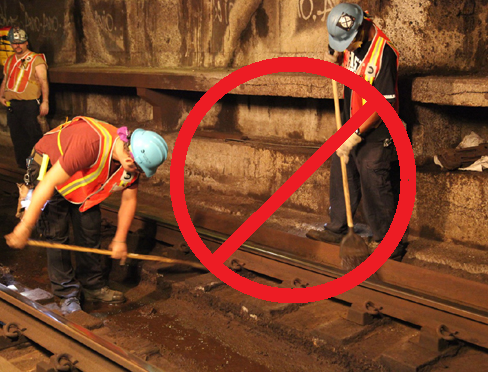 Track need not be scrupulously clean. Since I charge my batteries through the rails, I need some degree of electrical contact, but not the "clean room" standards that normal DCC requires. 2. Shorts on the track power rails do not stop battery powered locos. During op sessions, when one causes a short, by splitting a turnout or derailing, all locos in that power district go dead. So one has to divide up the layout into several power districts with separate boosters, or use power shields, or some other expensive solution to break the layout into power segments. Not so with battery power. They chug right through most shorts. No power districts needed. That is a real nice benefit that is frequently overlooked. 3. You don't have to wire your track at all if you don't want. My portable layout has no feeder wires to any of the rails except in the staging cassettes. That is right ....no wires, no frog juicers, no broken feeders. You do need to implement a recharging scheme but track power is not required. 4. With battery power, intermittent interruptions in track power do not cause the on-board loco sound to recycle. 5. Did I mention you don’t have to clean track. Folks with large fleets of locos that are currently DCC may not want to convert all their engines to battery power. But, you could very easily add battery powered locos to an existing DCC wired layout. The two systems work well together. That is what I did. Two of my locos have conventional DCC. The other 3 (with a 4th coming on board soon) will have battery power. Ted Pamperin added battery power to some of his problematic steamers to improve their performance on a HO scale DCC powered layout. I had previously wired the first sections of my layout for DCC. I still need to finish about 30 percent of my track. The question I face is whether to wire the remaining section for DCC or not, If I don't add the DCC wiring, then I will have to convert the last two locos from DCC to battery. However, I have already run the main bus wires into that section. I also have a frog juicer 6 pack unused. The frog juicers make DCC wiring pretty easy. So my current thinking is to wire the rest of the layout for DCC and use it as a power recharge source and DCC control for my first two non battery locos. If I was starting from scratch, I would not bother with wiring. Yes, one can assign any Stanton equipped loco to any Stanton cab. There are some other battery systems out there (see Del Tang, CVP Airwire, TamValley). Some are smaller and will work in HO scale locos. Note that my O scale steamers are not much bigger than HO modern diesels. It is also important to realize that installing a battery DCC system in my small steamers is actually easier than regular DCC. Why? When I do a DCC install, I have to completely disassemble the locos to add insulators and pick-ups on all the wheels. If I do not, then the loco performance is erratic and I have issues with dirty track, stalls, sound break-up, etc. With battery installs extra pickups are not needed. In fact, I got rid of the pickups on the pilot trucks on my first two installs as they aren't needed. The challenge I had with the first 2 locos has been room in the engines and tenders for the battery and battery power supply. The latest generation of SMRs brass locos has more room in the tenders, so installing will be much easier. The issue with the plugs between tenders and engines in not unique to battery power. The DCC locos have it too. I plan to hard-wire the rest and have a permanent drawbar between the tender and engine. My experience with moving these engines around is that the less handling the better. So the plugs will be moot. Using the Airwire T5000 I am able to program the Stanton Radio Tsunami DCC decoders to fine tune the performance. Notice I did not mention cost. I don't know if battery power is cheaper than DCC. I have both systems, so cost is a moot point. What I want is outstanding performance and simplicity. Battery power gives me that. With the current state of the art, I would say that battery power is not yet for everyone. Like the adoption of DCC, battery power will really take off when manufacturers start adding it to the new locos. The Stanton System is intentionally designed for layouts with just a few engines. The Del Tang system is incredible small and may find lots of applications. But any layout where electrical pick-up is an issue (just about all of the 200 plus layouts I have operated on including some of the biggest and most famous) could benefit from freedom of picking up current from the rails. For layouts like mine, where I am dealing with small, highly detailed, but finicky locos, battery power is imperative. 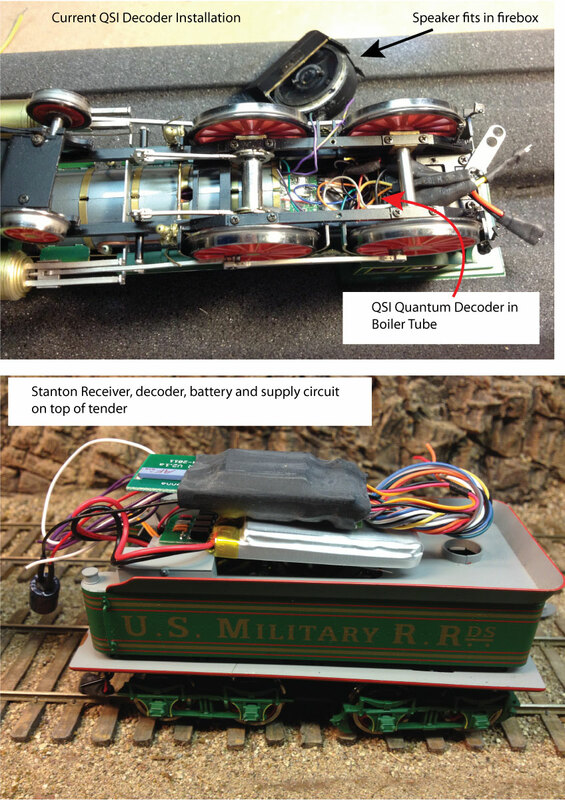 Radio controlled battery power has other applications on model railroads. Radio controled road vehicles are possibilities, especially with the tiny Del Tang system. Fellow ACWRR modeler Marshall Stull alerted me to the following document that contains several interesting items for 19th century railroads. Fourth Annual Catalog of Locomotives and Car Builders Supplies. It has a bunch of interesting drawings in it, especially of tools and surveying equipment. 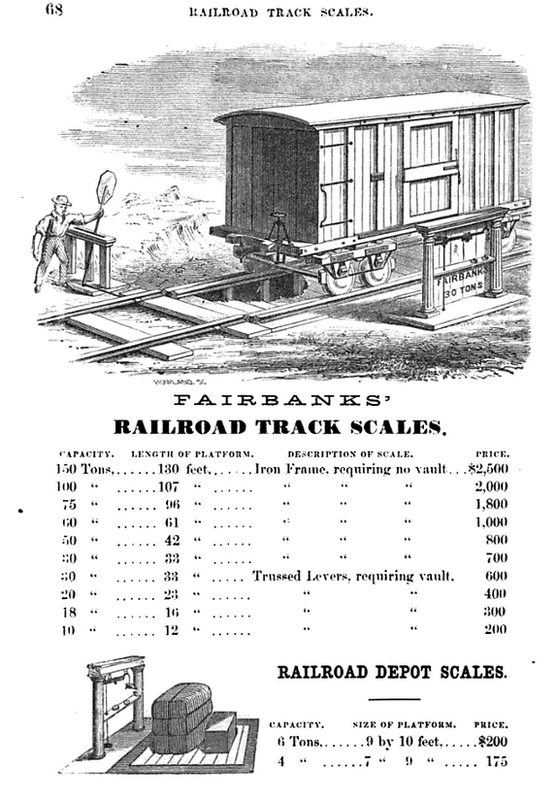 One item in particular caught my eye, this railroad track scale. It looks like an interesting item to add to a layout. Note the operator using a switch stand to move the rails from through route to the weighing tracks. It is unlikely that the USMRR had one on the Aquia line, but any commercial railroad would need these at several locations. Note the floor depot scale at the bottom, another useful detail one could add. I have added two more speaking engagements to my calendar. All but one of these talks will be about civil war railroading. If you are interested, here is the calendar of events. I hope to see you there. 11:00AM, April 5 Introduction to the Railroads of the Civil War, at the South Mountain Division Minicon, Fire Station, Blue Ridge Summit, PA.
10:00AM May 31, Introduction of Railroads of the Civil War and the USMRR Aquia Line. At the RF&P Historical Society, Salem Church Library, 2607 Salem Church Road, Fredericksburg, VA. This is a 1.5 hour talk that combines my ACWRR talk with a detailed description of my home layout. Membership in the RF&PHS may be required. 10:00AM Aug 2, Introduction to Railroads of the Civil War, at the B&O Historical Society Mini Con, St John's Lutheran Church, 101 W. Martin Street, Martinsburg, WV Membership in the B&OHS may be required. See http://www.borhs.org/Events/events.html for more info. Time TBD, Aug 8-10, Capitol Limited, N Scale East Convention, Chantilly Expo Center. See http://www.bigtrainlayout.org/ for more detail. This is part of the N scale convention. Resistration for the convention will be required. Time TDB, Sep 12-13, The Model Railroad Goes to War, Middle Atlantic Railroad Prototype Meet (MARPM), Wingate by Wyndham Hotel, Fredericksburg, VA. See http://www.marpm.org/ for more info. Registration for the meet is required. 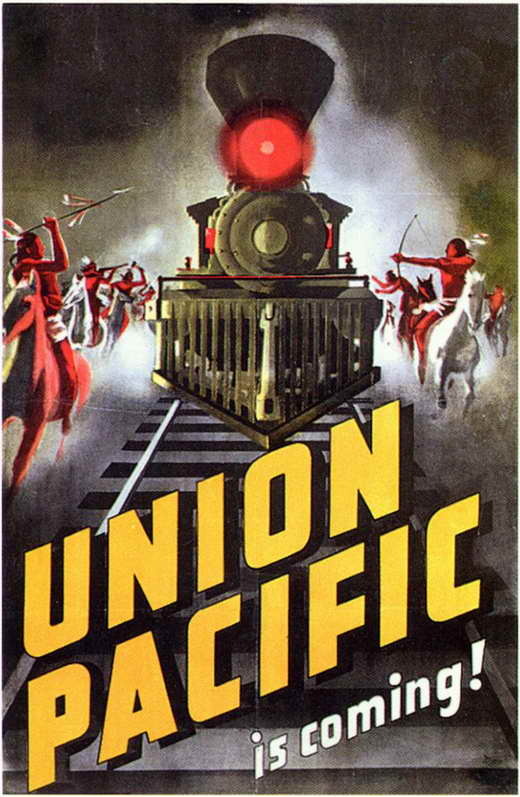 This will be a new talk I am developing to coordinate with my upcoming book about the role of railraods in warfare. The talk will include dozens of additional photos obtained from the National Archives and other sources not used in the book. Hopefully I will have copies of the book to sign at this event. The convention staff asks that you resister as soon as possible in order to reserve a spot. This library is just a few miles from the location depicted in my model railroad. We haven't nailed down the date yet. I'll post it when it is available. This event will probably be free to attend. 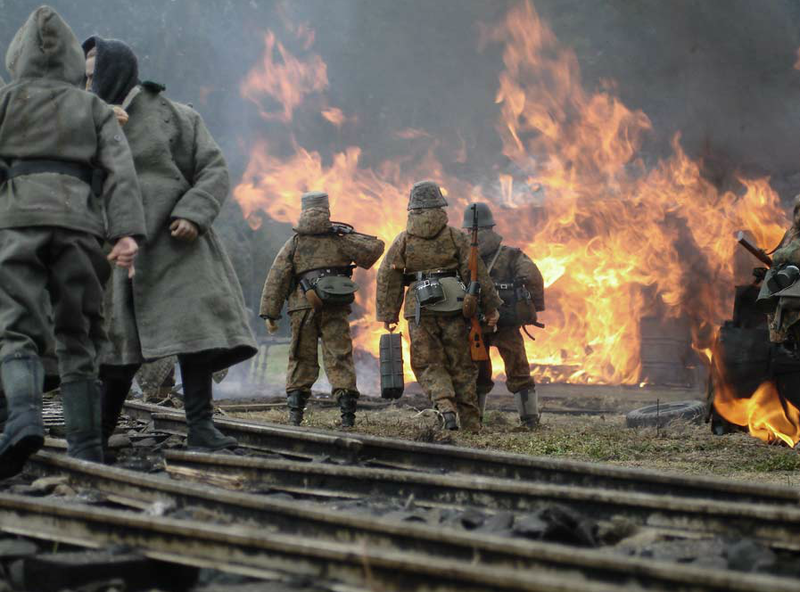 This is a group of UK modelers, called Kampfgruppe VonAbt, that work in 1/6th scale. They specialize in photographing their models to create realistic scenes. 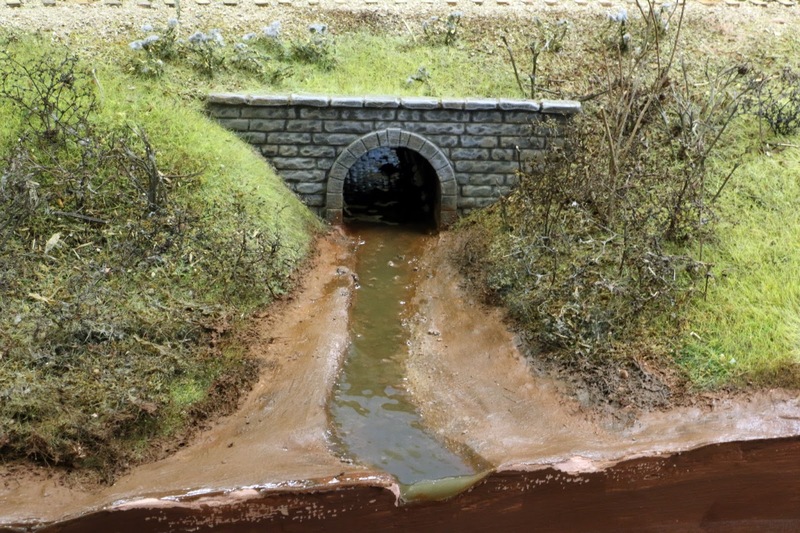 There are hundreds of photos of their hyper realistic dioramas on the site. That is real fire in the sample image from their Scorched Earth gallery. 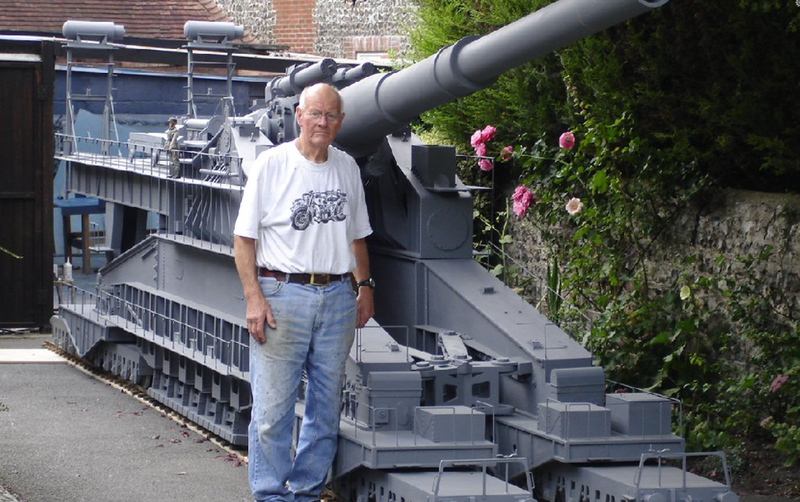 The fellow standing next to the Dora Rail Gun puts the size of these models in perspective. And yes, they do make 1/6th scale ACW figures. 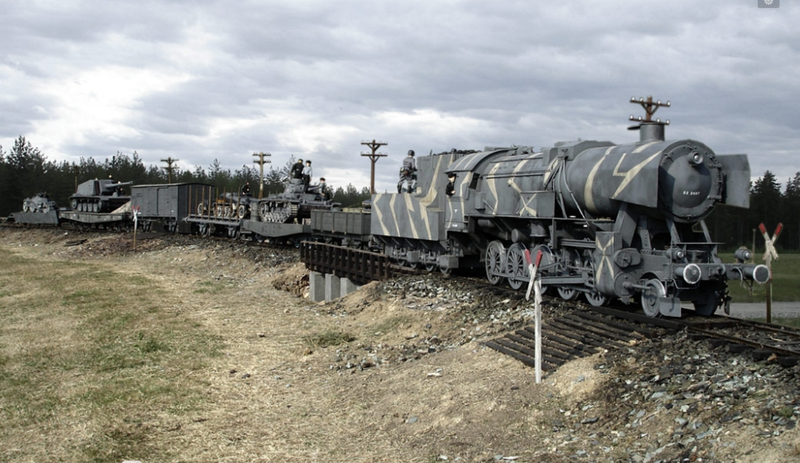 A 1/6 scale 4-4-0 would be awesome. 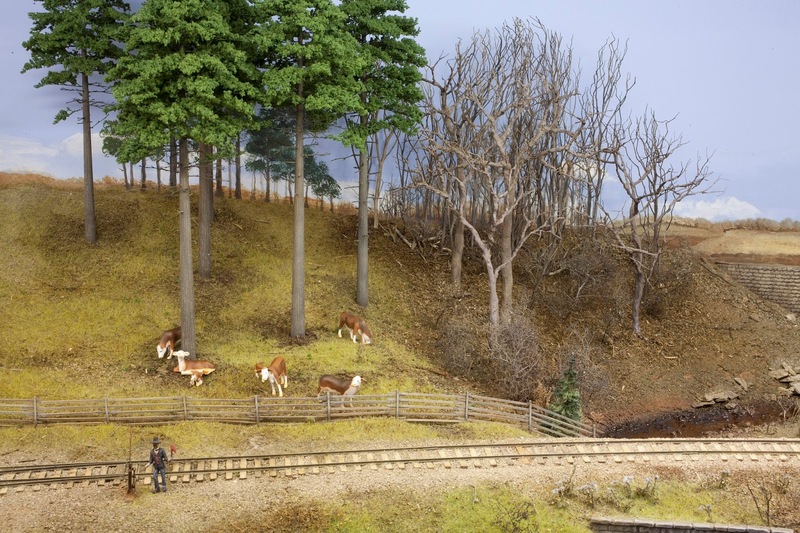 Check out Rosewoods website for some well done ACW scenes, but no trains.